Literature is the only means through which awareness is being created in the society since ages. From centuries, it’s humans who are providing direction and predicting the future using the power of words. It’s believed that it’s only words bind thoughts and behavior of a writer with those of a reader. The Weekly Hindvasi, from the day it was born, has used this strength of words to hold the pulse of the cultured society and has become not only the mirror but a torch to light the way and show the correct path to the common man. As far as my knowledge goes, Hindvasi newspaper is being published since 1918.I remember when I was child, from 1960 to 65, when I used to go to school,because of my parent’s respectful teaching profession, we used to get all the Sindhi Newspapers at our home. We used to read all these newspapers with a lot of interest along with our schoolbooks. The moment we used to receive the Hindvasi newspaper, all 16 pages would get distributed between us. Our father used to take 2 pages of politics &literature. Mother would read kitchen related articles by Kala Premlani. I would take Stories and Poems, and my brother “Ghansho” would take the Devnagiri version of “Balkan Ji Bari”. He would search for the puzzles and solve them. Within half an hour we used to finish reading our favourite pages and then read the rest of the newspaper peacefully. 5 of the homes in row would read this and by that time the new edition would also be published. We must be receiving hundreds of such publications. I don’t remember exactly, but during those days without waiting for the agent to deliver the Hindvasi newspaper in the evening, my father would rather collect the paper from agent’s office in the morning itself. In this manner, Hindvasi has become a treasure and wealth in our lives. 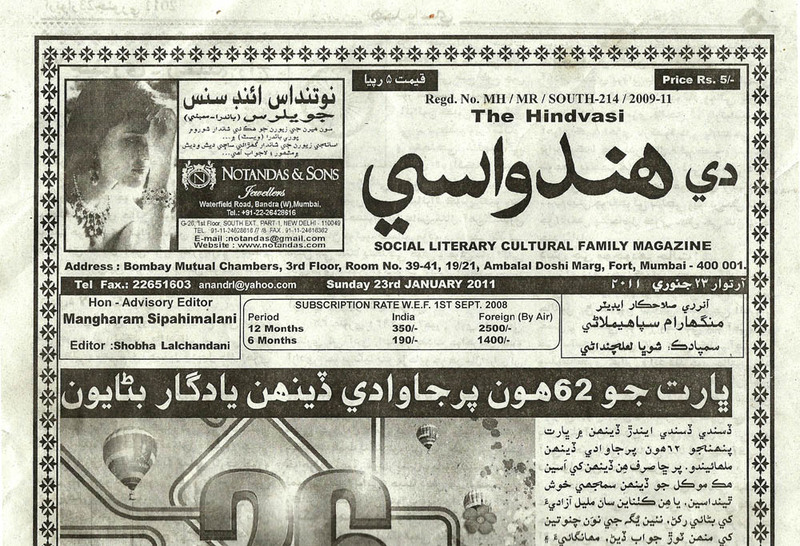 Even today, can you tell me which another Sindhi newspaper is published keeping readers in mind? Week after week? The articles are always fresh and not repeated.All the articles are well researched and there are no false or fake stories. The choice of words in the newspaper is always perfect, and vulgar or obscene language that can astray the youth, is never used. Neither are any hypothetical or delusive thoughts shared, but personal experiences of writers and real incidences of life, with elaborate examples, that are published, nourish one’s soul and ease one’s mind. In due course of time, the number of readers might have reduced, but still this weekly newspaper is awaited by its loyal readers. If every year on the occasion of Cheti Chand, the cover and back page is printed in color, the sponsors advertise, and 6 to 8 editions are printed on glossy paper, I feel delighted. I appreciate the effort and congratulate Shobha and Ram Lalchandani,who have readily shouldered the responsibility of publishing the newspaper with all their heart and soul. Since the time that they have started publishing this newspaper, they have been regular. I know how many trials and tribulations they go through to keep this newspaper running. Hindvasi, in true sense, represents the voice of the common people and strives for the well being of the society. Hindvasi is not only the medium of entertainment and education but has also,time after time, during calamities, supported in bringing together the disturbed generation. That calamity can be an attack by Pakistan or natural disasters. Hindvasi has unveiled the informative side of every news. After strong and experienced editors like Hiranand Karamchand and Teerath Sabhani, Shobha Lalchandani is now sincerely shouldering the responsibility with full dedication along with her husband Ram Lalchandani. In today’s day and age, business and science have posed the challenge of fast progress for literature. In this century, only politics without principles, gaining wealth and prosperity without putting in much effort, education without the required quality, business without ethics, prayers without devotion, using languages other than one’s mother tongue are some of the grave issues faced today. In such contradicting conditions, Hindvasi itself and we have to struggle. And we all have to work hard on our horizons. Words have to be re-born like a saint or fighter. From Sakrat to, Meera Bai, from the eight editors of Hindu to Hindvasi, everyone has had to go through rough times. Let’s hope that Hindvasi will do justice to its heritage and culture. It will struggle in all ways to survive and be useful to the society and will have the courage to go hand in hand with times. Let’s come together and maintain our motivation levels towards Hindvasi.